WITH far greater frequency than a hurricane strike in the Floridas, the biggest names in the political and climate world gather at exotic locations around the globe to pretend that they are intent on “saving the planet”, again. Quite simply the Oscars of virtue signalling. YET it’s (almost) set in stone that these confabs will fail their primary objective. That is, to force rich countries to quietly destroy their economies and for the poor economies, with the highest death rates, to reject energy and prosperity. THE only resolution guaranteed by all ‘parties’ (excuse the pun) is where to hold the next, taxpayer-funded climate change junket. MEANWHILE, all those taxpayer funded frequent flyer miles hurt your hip pocket and apparently the planet too. Or, maybe only when it’s you doing the flying…? COP 24 just concluded in Poland. Nearly 23,000 climate saviours attended this 24th annual climate carnival. Every year, plane-loads of concerned busybodies fly to some interesting new location to spend tax dollars on a well-fed 12 day holiday. They concoct plans to ration and tax the energy used by real workers, farmers and families back home. Few delegates arrived by bicycle or solar-powered plane – a fleet of at least 100 commercial, private and charter aircraft brought them at a cost estimated at US$57M. When the costs of hotels, ground transport, food, entertainment, air conditioning and office services are added, the bill is likely to top $500 M.
Australian taxpayers supported 46 junketeers. Now these Chicken Littles are back home spreading climate scare stories and lecturing locals to not overspend on Christmas presents. There is a bright side – all that carbon dioxide emitted by planes, cars, buses, heaters, stoves, beer, champagne and Poland’s coal-fired power stations will help global plant growth. One of the largest conferences of the year just wrapped up this past weekend in Katowice, Poland. And it was on everyone’s favorite subject, climate change. Yes, this is the annual conference where tens of thousands of delegates fly into a foreign town. On your tax dollars. To iron out a plan for the future of the planet. It’s called the United Nations Climate Change Conference. And this years’ went under the short name of COP24 (Conference of the Parties – 24th edition). And it was the second biggest one since the monster Paris Climate Change conference back in December 2015 (COP21 for those keeping count). According to this official attendance list, there were 22,700 delegates from 197 countries there. This conference was not a weekend or even a week long. It was hosted for 12 whole days. But first, all these people had to get to the COP24 Climate Change conference. And unfortunately, zero-emission transit was not available to get them all to Katowice. There are no bike lanes crossing the Atlantic Ocean or the Mediterranean Sea. These attendees took commercial, charter and private planes to get to Katowice International Airport just north of the city. For all their green agendas, they flew the big, bulky, carbon-spewing and nature polluting airplanes. Without every receipt, it’s not easy to pinpoint how much various flight types cost. But you can bet even those travelling on commercial aircraft were not flying with the common folk. Let’s assume $2,500 per person to fly to and from Katowice, Poland. Cost of Flights = 22,700 x $2,500 = $57 million dollars. Thinking that the delegates like to travel together, let’s be conservative and say they all flew commercial on a Boeing 747 in groups of 227. Unlikely, but it makes our napkin calculation simple. According to Blue Sky Model, 1 mile of flight produces about 53 pounds of carbon dioxide for the average plane. Now sticking with simplicity, let’s assume the average flight was just about the distance between New York City and Katowice – 4,283 miles. In reality, people flew from as far away as Auckland, New Zealand. The total amount of carbon emitted = 100 planes x 4,283 miles x 53 pounds per mile x 2 trips = at least 45 million pounds of evil, harmful polluting carbon dioxide into the air. Do as the cultural communists say, I guess. Not as they do. For reference, WIRED Magazine estimates that all the planes that flew to the Paris climate talks released about 575 million pounds of CO2. Now let’s correctly assume that politicians, dignitaries and their entourages didn’t stay in Holiday Inn’s or Best Westerns like the working class. And since this conference would be among the top destinations in the world at this climate change time of year, hoteliers would have increased their nightly room prices. It’s Opportunism 101. So let’s allow $500 per night for hotels or private flats. Katowice and the surrounding areas aren’t exactly Paris. So things are a bit more affordable. Delegates then had to drive the roughly 34 kilometers (21 miles) to the city core. Heaven forbid if these people all took the transit system. How could they possible hold a dignified image taking the subway or public buses? So they likely hired private cars and limousines. The rates for these vehicles goes anywhere from $500 – $1,000 per day. Let’s assume some attendees followed their agendas and carpooled, thus requiring only 20,000 cars. Let’s not forget that people need to eat. And when in Poland, you can’t be eating Subway or McDonalds. How can you possibly pair a fine Bordeaux with a Big Mac? So we have to factor in meals and entertainment. Most attendees will have gotten a per diem for their travels. We can safely assume these costs to be anywhere from $100 – $500 per day depending on their stature. And what about the workers who put it all together? The average wage in Poland is just shy of $1,170 per month. Data on workers hasn’t been released yet. But at the Paris conference 3 years ago, there were 3,000 workers hired directly for the conference and about 11,000 police and military to keep the place secure. Let’s assume the same amount of security and workers were used in Poland. There is a good chance I have been too conservative and underestimated some of the costs. The cost of saving the future world for just a couple weeks was half a billion dollars. But you’ll be happy to know that the official meal plan for attendees had some options for a low emission footprint, as you can see below. Wait, did I not mention the pre-conference in Costa Rica? ONE wonders if any of the 22,771 taxpayer funded climate crusaders actually know what their favourite buzz-word “sustainability” actually entails? WHEN will climate-theory-obsessed politicians and sycophant media finally call off their global warming climate change jihad that’s punishing the poor without helping the planet? WE were told we’d have more cyclones, not less. WE were promised “permanent” drought, not record rains. WE were promised less snow, not more. WE were promised more “extreme weather”, not less. WE were promised fewer crops, not record output. WE were promised fewer polar bears, not more. WE were promised more global warming, not a near twenty year warming “pause”. POWER prices through the roof. PENSIONERS unable to pay for their heating or cooling. IT’S time to count the shocking price we’ve paid for listening to global warming scaremongers like Tim Flannery. BY December 2008 Adelaide’s reservoirs were 75% full, Perth’s 40%, Sydney’s 63%, and Brisbane’s reservoir’s were 46% full. BY 2009 dams for Brisbane, Canberra and Sydney were filled to overflowing. PRESENTLY Adelaide’s reservoirs are 57%, Perth’s 39%, Melbourne’s 59%, Sydney’s 77%, and Brisbane’s reservoir’s are 83% full. Australia’s east coast is no stranger to drought, but the dry spell that began in 1998 is different from anything that has gone before….The cause of the decline of rainfall on Australia’s east coast is thought to be a climate-change double whammy – the loss of winter rainfall and the prolongation of El Nino-like conditions. The resulting water crisis here is potentially even more damaging than the one in the west … As of mid 2005 the situation remains critical… very little time to arrange alternative water sources such as large-scale desalination plants. $12 BILLION worth of desalination plants built in South Australia, Queensland, NSW and Victoria have all been mothballed without producing a drop of water. All were built in preference to much cheaper dams, because of green bans and because warming alarmists claimed the rains would not return. FIVE desal plants have been built in Australia. Only Perth’s is used. COSTS to run each mothballed deal plant are estimated at between $500,000 to $1,000,000 per day, every day until contracts run out around 2030. IF the “science is settled”, what’s the point of continuing further climate research? Research that always begins with the pre-conceived notion that human emissions are causing X so we need to spend Y and you need to do Z in order to avert disaster 100 years from now, “based on our high-tech model simulations”. RESEARCH to study natural variation, important for climate predictions for agricultural industry and emergency services etc is scoffed at and simply NOT granted. SO, the $1.6 BILLION will again be spent purely on activist CO2-centric ‘science’ fermenting the ‘warming’ scare in order to maintain and even increase funding if the new problem discovered is bigger than the last one. The scare self-perpetuates. AUSTRALIA should cut all climate ‘science’ funding or at least dedicate 50% to natural variation studies that look at variables like maybe…the Sun! The real driver of climate change. 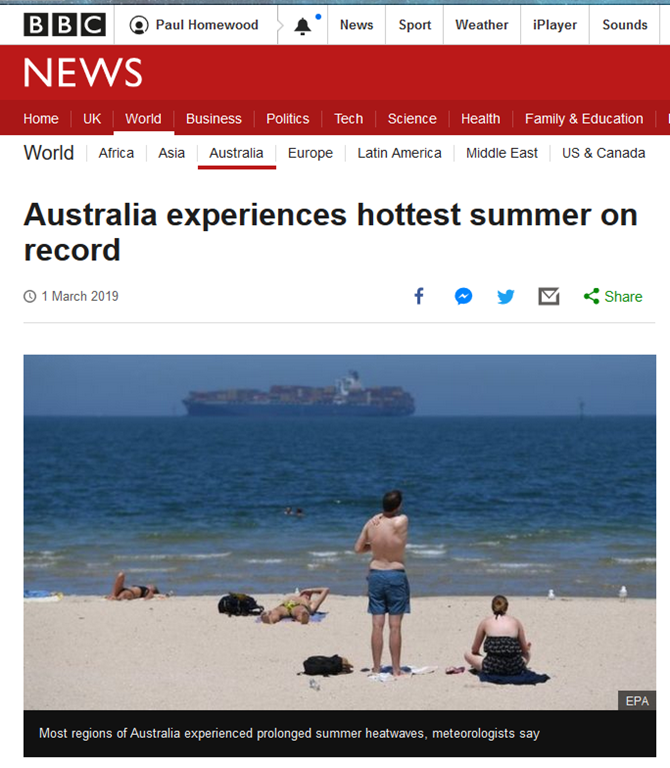 Australian climate scientists are whinging about the newly announced Federal budget for 2019. Who can blame them? The total to be spent on climate-related research has been reduced to the abysmally low sum of AU$1.6 billion for the next fiscal year which begins 1 July 2018. [Yes, that is billion with a B]. While 1.6 billion Australian dollars (just over 1.2 billion US dollars @ today’s exchange rates) may seem like a lot of research money for a country that doesn’t have the necessity of maintaining fleets of satellites or ocean-going research buoys, but it is a very sharp reduction from the AU$3 billion they were allotted for the current year. AND on the third day BILLIONS became TRILLIONS! Taxpayers hard-earned money sacrificed at the alter of “climate change” all to try to create some kind of perfect climate nirvana. It took the proletariat a nanosecond to work out that wind power can, and will never, work as a meaningful power generation source. 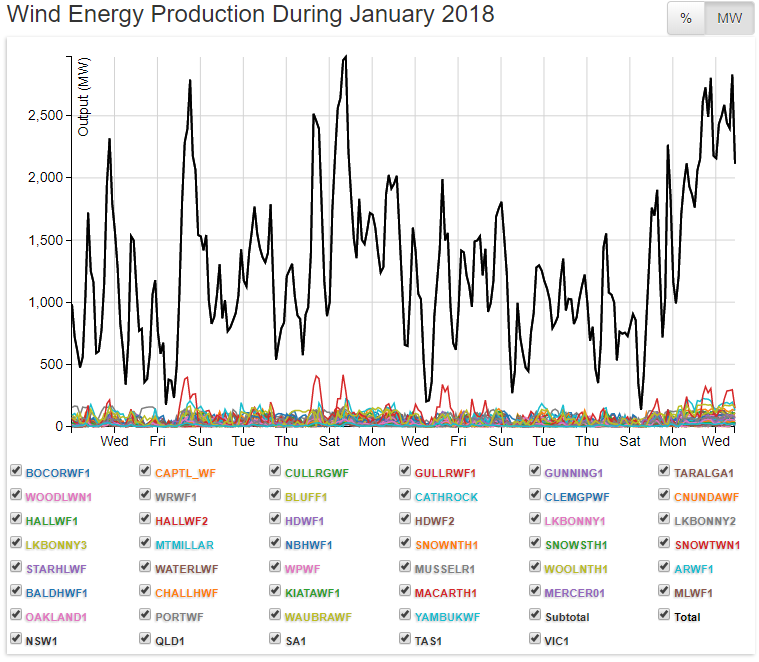 Graphs like the one above – depicting the entire output of every wind turbine connected to Australia’s Eastern Grid (spread across four states, NSW, Victoria, Tasmania and South Australia) – quickly gave the game away. 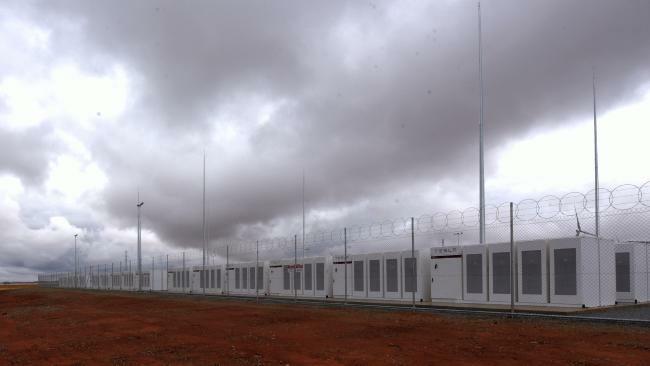 Challenged with the inherent unreliability and obvious intermittency of wind power, those pushing it have been reduced to chanting mantras about mega-batteries saving the day. The way they tell it, it’s as if they simply left grid-scale battery storage off their shopping lists – like some muddle-headed shopper returning home without milk and bread – and all they needed to do was pop back to the shops to collect some. A bargain struck by economic vandals: $150,000,000 for 4 minute’s power. ONE of the great propaganda lines of the climate change industry is the boom in ‘green energy jobs’ meme. A jobs boom is sweeping across regional Australia and there’s one industry to thank – the renewable energy sector. From places like Gordon in southern Tasmania to Pindari in north-east NSW, new solar installations, windfarms, battery arrays, solar towers and pumped hydro facilities are springing life into regional towns. How are they doing this? By injecting desperately needed investment and job opportunities into remote locations. This is great news! But despite the steady stream of new developments in regional areas, we’re actually being short-changed. Policy uncertainty due to ongoing internal squabbles in the Federal Government is strangling the growth of this sector and costing regional Australia the true jobs boom it deserves. If politicians could simply commit to a modest and achievable 50 per cent renewable energy target, this would create 28,000 new jobs. The vast majority would be in regional Australia where they are greatly needed to breathe new life into struggling local economies. NO one would deny that job creation is a good thing especially in regional centres and remote locations in Australia. Areas with often high rates of unemployment and limited opportunity. BUT, where the ‘green energy jobs’ argument falls down is not only in the longevity of the full-time jobs available after installation, but in the fact that these jobs are a direct result of green central planning. Green jobs are like ‘Fiat money’ – a currency without intrinsic value established as money, often by government regulation. WITHOUT massive government subsidies, estimated at $60 BILLION by 2030 under the Australian government’s RET (Renewable Energy Target), their would be no ‘green’ jobs as advertised by The Daily Advertiser. The private sector simply will not invest in weather-dependent ‘energy’ sources when in competition with cheap, efficient, reliable base-load sources like coal and gas on a dollar-for-dollar or subsidy-equalised basis. BEWARE The Big Government Blob! WE only have to look at Germany’s €TRILLION green energy disaster – Energiewende – that has trashed the German economy, destroyed her industrial heartland and left hundreds of thousands of German’s disconnected from the grid, unable to pay their power bills. GREEN central planning like economic planning of failed socialist regimes gone by is doomed for failure. Market distorting policies that pick winners only work until the money runs out. THIS is the intrinsic problem faced when big government and statist green central planning displaces the commercial sector. Market mechanisms are eliminated, the very mechanisms that promote checks and balances and ensure accountability to make sure stuff works. THE “green” energy revolution with its touted “green jobs” is largely survived by rent-seeking corporations entering the “save the planet” sector in pursuit of the lucrative government funds, grants and subsidies on offer, supported pro bono by the virtue-signalling, “save the planet” mainstream media. “Renewables are a welcome part of the energy mix but they don’t sustain long-term jobs or provide baseload power,” said Opposition Leader Deb Frecklington. What is set to be Australia’s largest wind farm will provide only 20 full-time jobs once it goes into ­operation next year. Construction started yesterday on AGL’s $850 million ­Coopers Gap wind farm at Cooranga North, 250km west of Brisbane, 10 years after it was proposed. The state government, which is committed to a 50-50 split between renewable energy and fossil fuel energy production by 2030, has endorsed the project, with Energy Minister Anthony Lynham turning the first sod. Two hundred jobs will be created during construction of the 123-turbine, 453 megawatt facility, which will provide enough power for 260,000 homes. During the election campaign in November, Premier Annastacia Palaszczuk spruiked her clean energy policy at the under-­construction Clare Valley Solar Farm in north Queensland — a project that will employ up to 350 people during construction, but offer only five to 10 jobs once ­operational. ADVICE to marketers of the unreliable-energy jobs ‘revolution’. May I suggest lobbying the private sector and extolling the virtues of so-called “cheap, clean and green” energy to them, rather than writing propaganda, puff pieces in the daily rags and insulting the intelligence of your audience…the ones who now have to pay the highest power prices in the world thanks to the unreliable energy ‘revolution’!